Jordan Market Meat Department offers a large selection of meats, poultry and seafood that can be found at our front counter. Staffed with expert butchers, our butcher shop provides a wide variety of meats including poultry, beef, lamb, veal and pork. 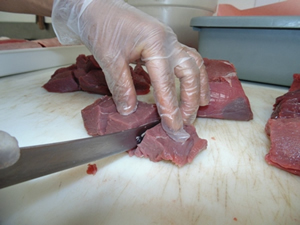 Our experienced team knows how to trim your meat just the way you want it. 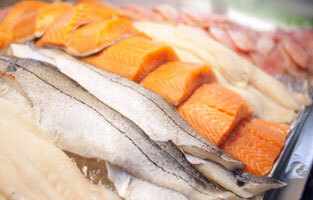 They are on location and ready to answer your questions or help you with special requests on seafood or any meats. 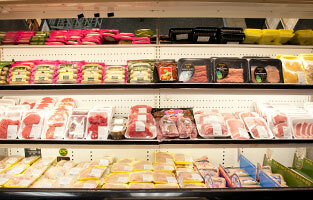 Stop by and check out our daily specials and find the highest quality meats today. Meat is a natural part of a balanced diet. 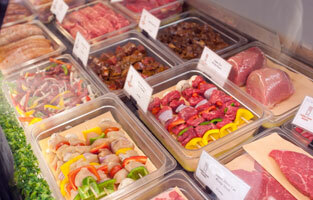 Meat is useful in ensuring a good balance of energy, protein, vitamins and minerals within the diet. Meat contains a number of essential nutritional elements - protein, for instance, has a high biological value. When measured by energy unit, protein is more satisfying than carbohydrates and fat. As the availability of lean cuts is wider than ever, avoiding excess fat is quite easy. Meat is a good source of vitamin D, which prevents osteoporosis. Additionally, meat contains a number of vitamins such as B1, B2, B6, B12 and niacin as well as iron.